I've been an avid gamer for more than 20 years, and especially love the genres of horror, RPGs, and puzzle. 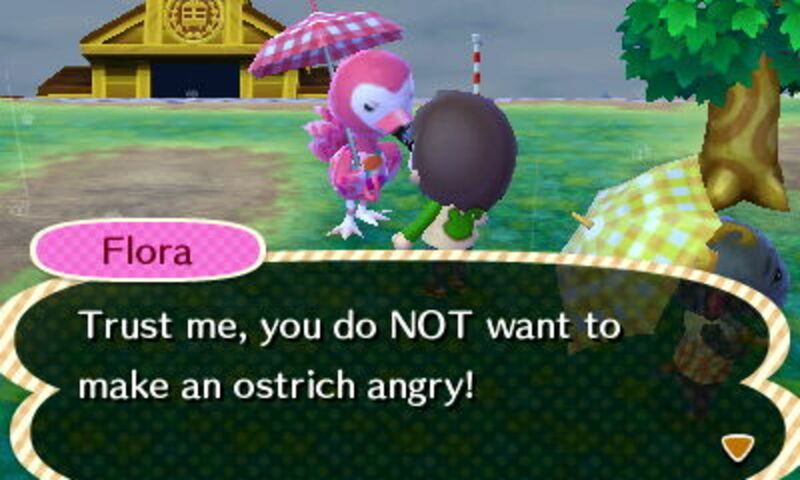 The Animal Crossing games are full of different critters for you to interact with. There are all kinds of animals, from cats and dogs to penguins and deer. 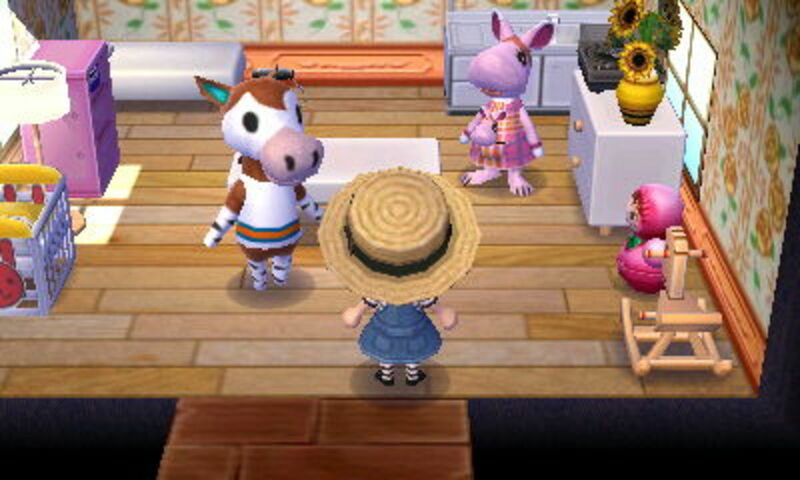 One of the best parts of the game is having your favorite villager move in! Everyone has their favorites - here are mine for each different species of animal found in Animal Crossing! My favorite alligator is Del. He has the 'cranky' personality, which for some reason I am partial to! I love his two-toned body and his long fangs. His initial phrase his "gronk". He is in the Animal Crossing: City Folk and Animal Crossing: New Leaf games. Anteaters are one of the more obscure animals found in Animal Crossing. 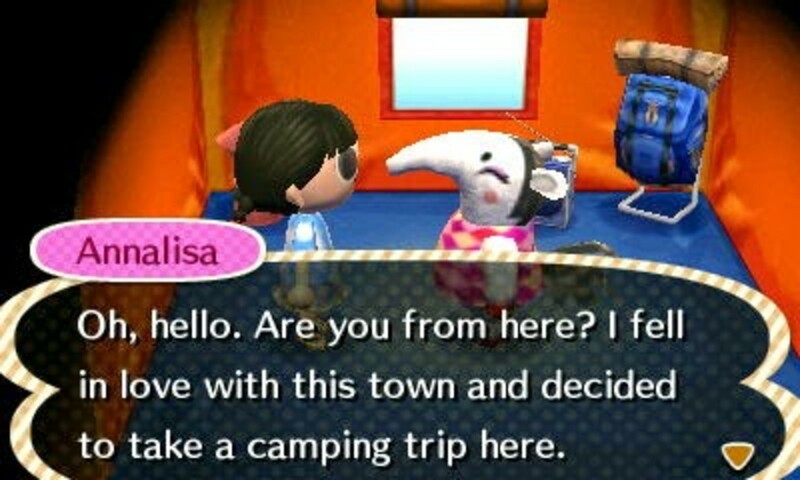 My favorite anteater is the cute, 'normal' personality Annalisa. She is mostly white and says 'gumdrop' when you first meet her. She has so far only appeared in Animal Crossing: New Leaf. There are quite a few bears in the Animal Crossing series. Chow is my favorite. He is another 'cranky' villager. He looks like a pink panda bear, and says 'aiya' at first. 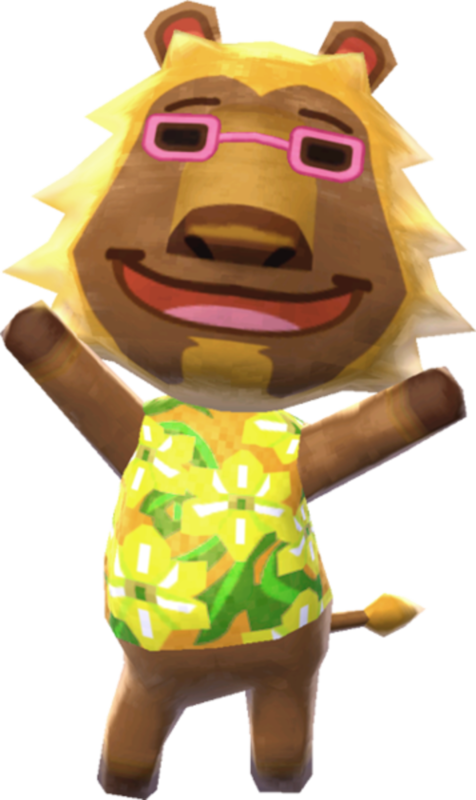 So far, Chow has been in all the Animal Crossing games! 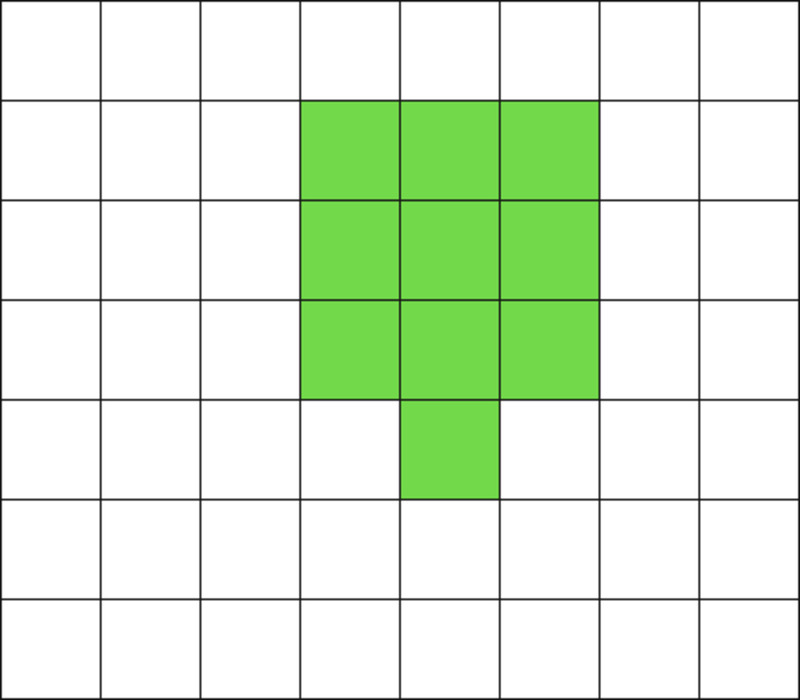 There are also a lot of different colored birds in the series. 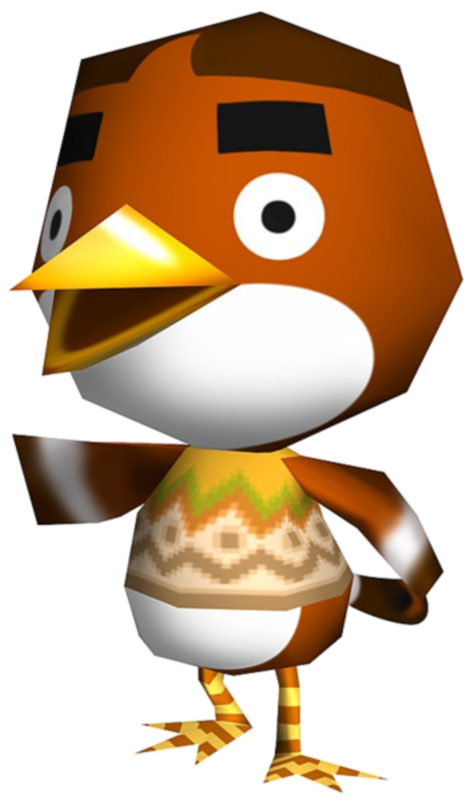 My favorite bird is Anchovy, a 'lazy' personality villager. He is brown and his initial phrase is 'chuuurp'. Anchovy has also been in every Animal Crossing game so far. 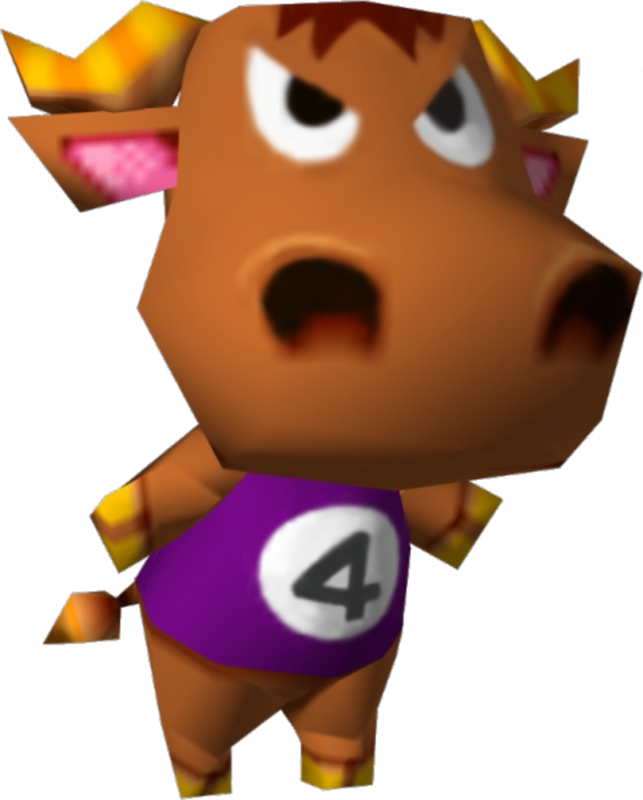 The bulls are male cows in Animal Crossing. My favorite bull is Chuck. 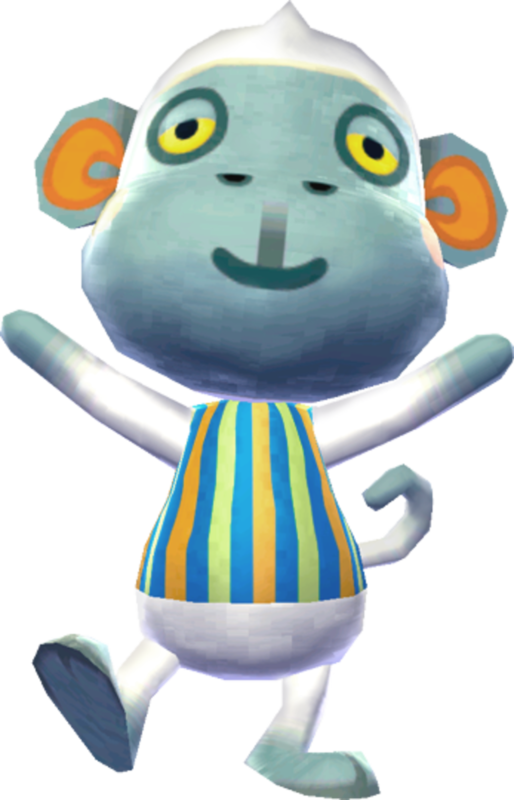 I'm partial to Chuck because he was one of the first villagers in my first ever town in the original game. Chuck is 'cranky' and says 'jerky' when you first meet him. Sadly, Chuck was only in the original Animal Crossing games. The cats are some of my favorite villagers! My most favorite though is Punchy. 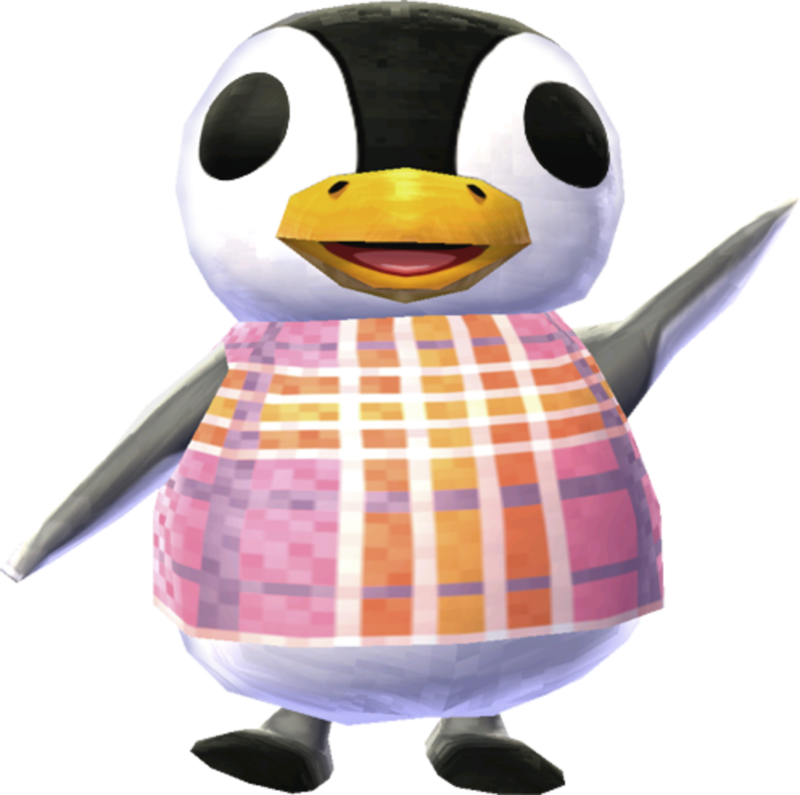 In fact, Punchy is my all-time favorite Animal Crossing villager. 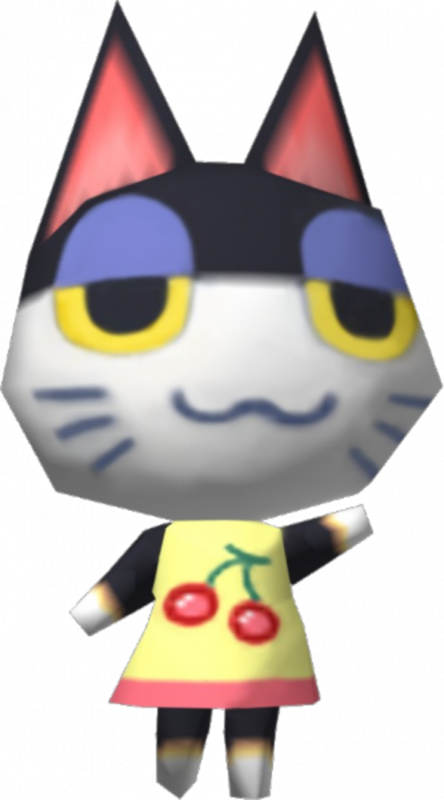 Punchy is a 'lazy' villager who says 'mrmpht'. He has cute half-lidded eyes and is black and white. He has been in every Animal Crossing game yet. 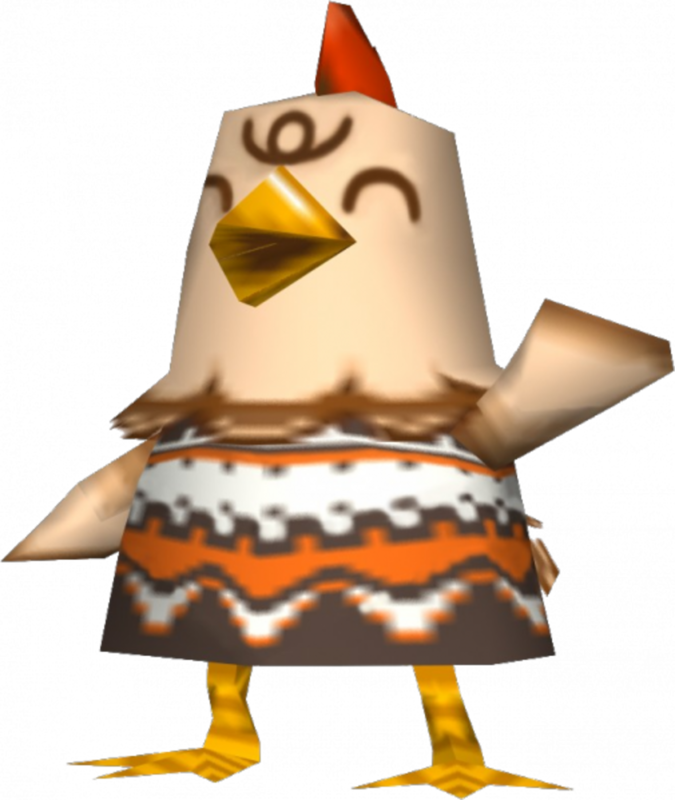 There are male and female chickens in the Animal Crossing games. My favorite is Betty, a 'normal' personality chicken. She is tan and says 'cluckling'. 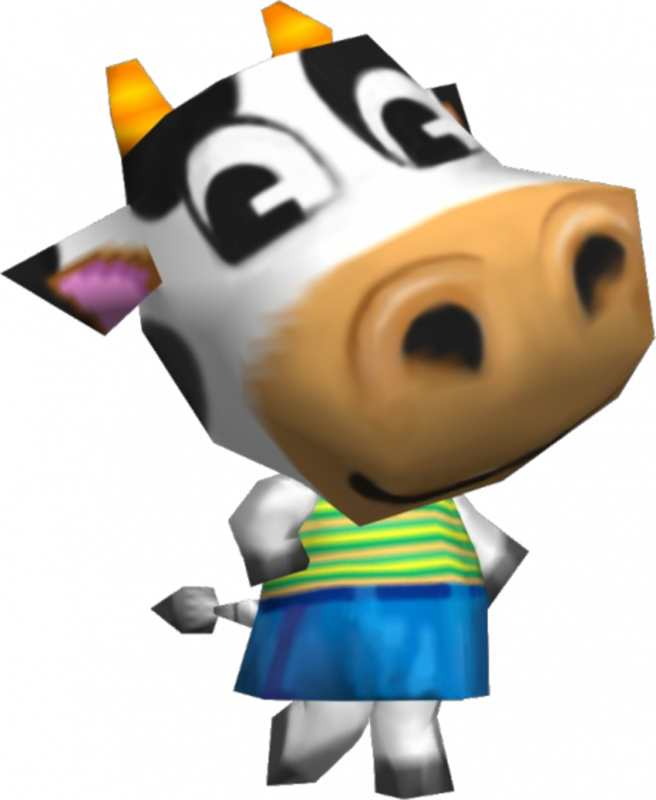 She is very sweet, but sadly she only appeared in the original Animal Crossing games. These are all females. My favorite cow is Belle. She looks like a standard black and white cow. Her initial phrase is 'cuddles' and she has a 'peppy' personality. 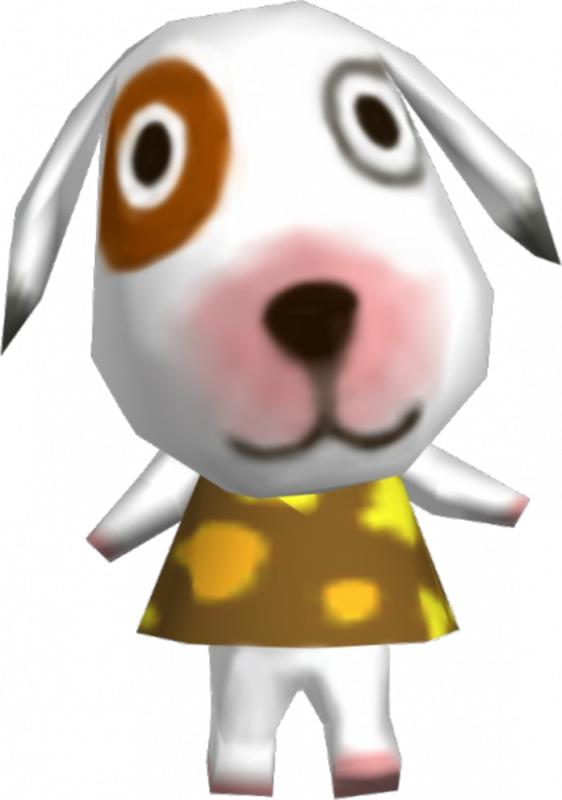 For some reason, Belle was only featured in the original Animal Crossing games. Cubs are the smaller bears of the Animal Crossing world! My favorite cub is Maple. She is a cute brown bear with a 'normal' personality. Her initial phrase is 'honey'. 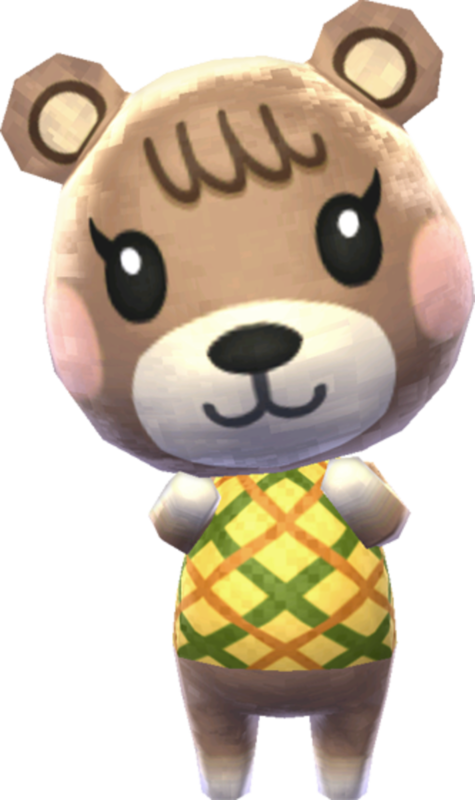 Maple has been in every single Animal Crossing game so far. Deer are a new animal for the latest game, Animal Crossing: New Leaf. My favorite deer is Fauna. She is a classic brown deer with a 'normal' personality. She says 'dearie' when you first meet. There are lots of dog villagers, and they are some of my favorite villagers. 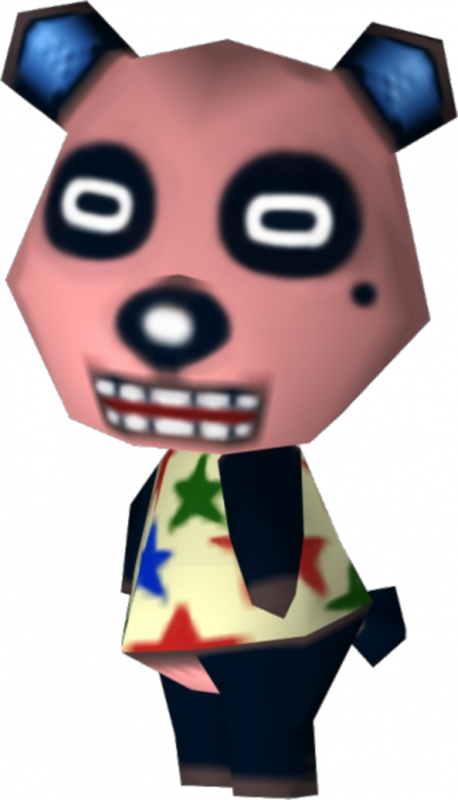 My number 1 is Bones, a 'lazy' villager with a brown spot around one eye. He's very cute. 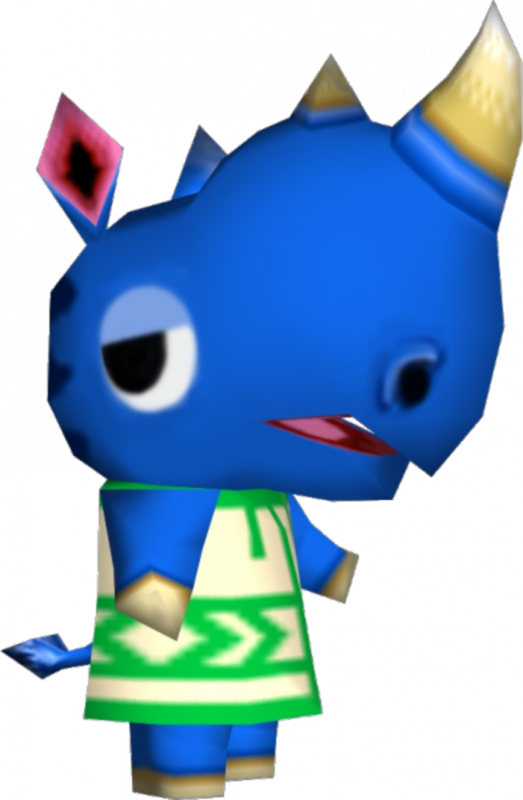 Bones initially says 'yip yip' and he has been in every Animal Crossing game so far. There are quite a few ducks in Animal Crossing, in all different colors. My favorite duck is Freckles. 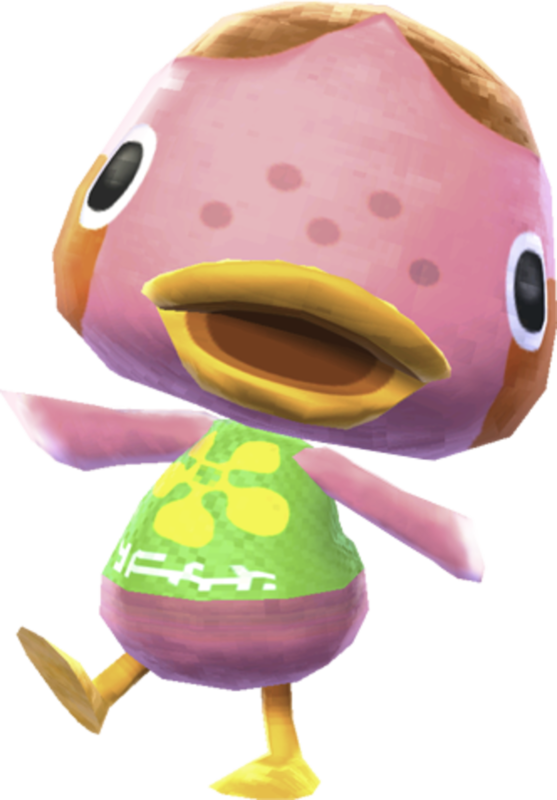 Freckles is a pink duck who has been in every Animal Crossing game. She is 'peppy' and says 'ducky'. Like her name, she features freckles across her face. Majestic eagles are one of the rarer animals in Animal Crossing. 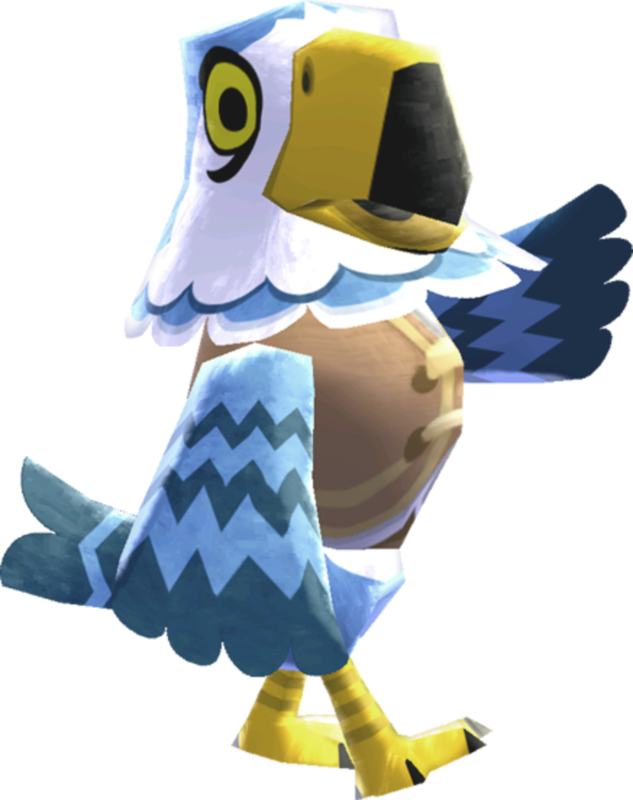 My favorite eagle is Pierce, a 'jock' personality villager. He has bright blue feathers and initially says 'winger' or 'hackeye', depending on which game you play. He is in all the Animal Crossing games. 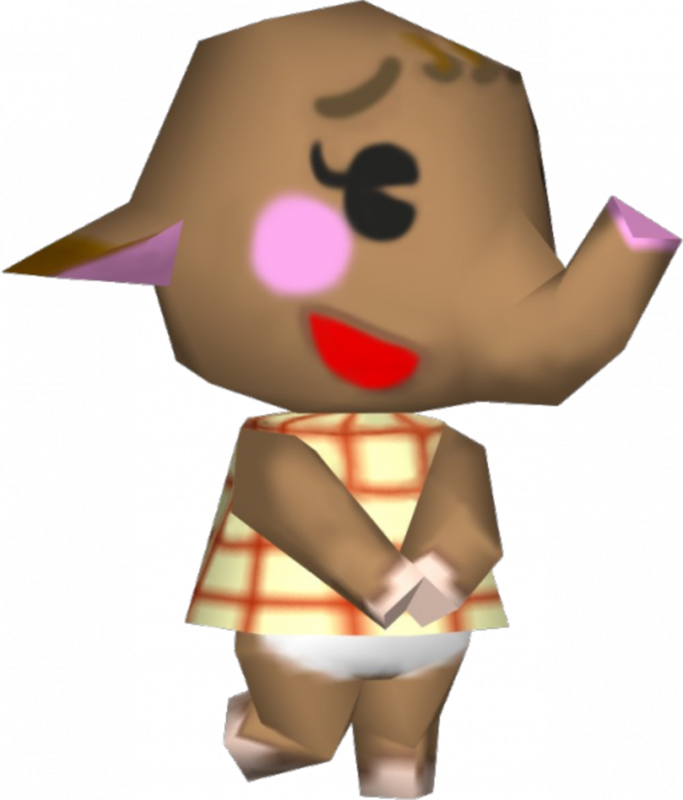 Animal Crossing elephants are super cute. My favorite is Ellie, a brown elephant with a 'normal' personality. She has a tilted mouth and rosy cheeks. Her initial phrase is 'wee one'. She was only in the original Animal Crossing games. Animal Crossing features a lot of frogs. My number 1 frog is Huck, a gray frog with half-lidded eyes and a cute mouth. He is 'lazy' and says 'hopper' at first. 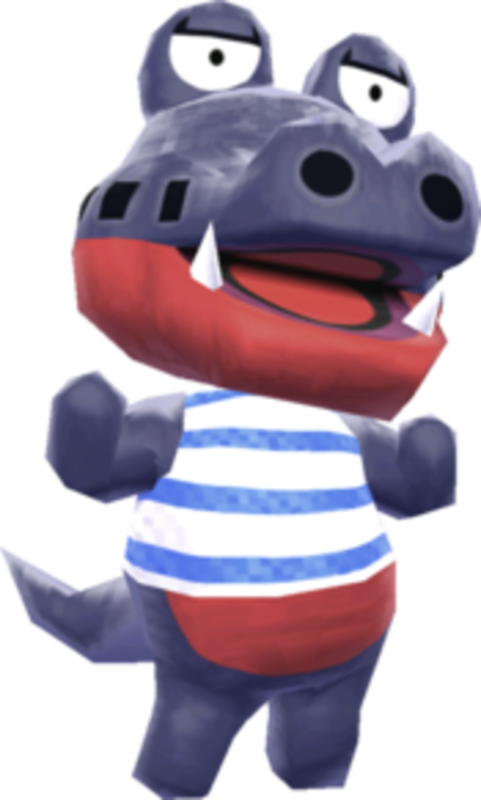 Huck is only found in the original Animal Crossing games. Cute goats are one of the many animals found in the series. My favorite goat is Nan. She is a 'normal' villager who says 'kid'. She is a black goat who first appeared Dobutsu no Mori e+ and has been in the games since. Gorillas are not my favorite animal, but in Animal Crossing they somehow manage to be cute! My favorite is Cesar. He is a 'cranky' villager with a silly mustache and goatee. He says 'highness' at first. He has been in every Animal Crossing game. 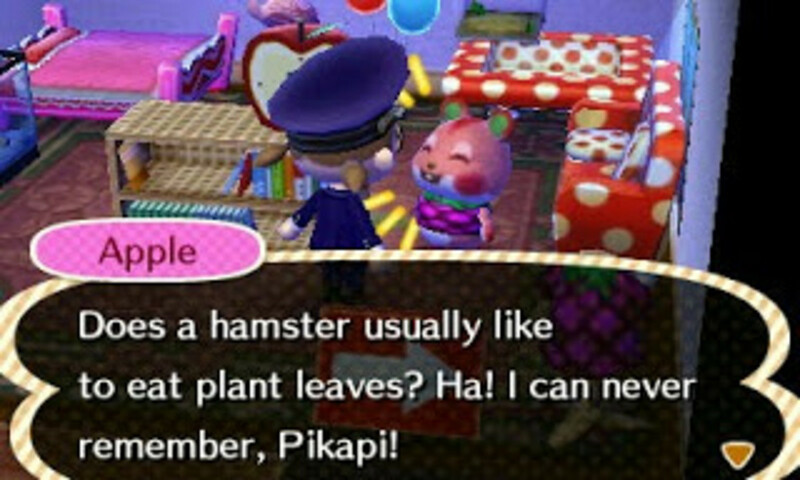 Hamsters are a new animal found in Animal Crossing: New Leaf. My favorite hamster is Apple. She is a peach colored hamster with one cute little tooth. She has a 'peppy' personality and says 'cheekers'. I love the hippos in Animal Crossing. I love their big heads. 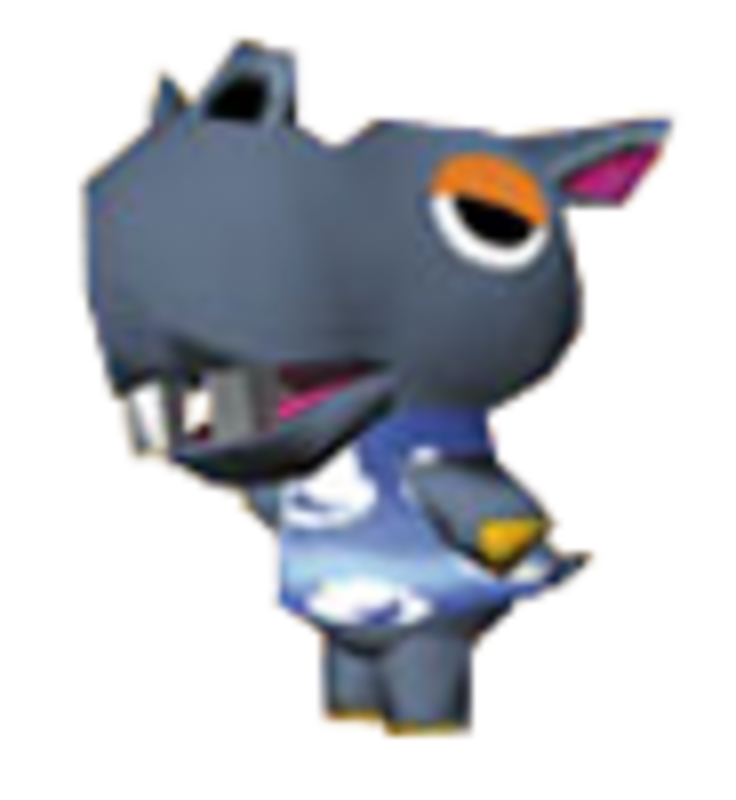 My favorite is Rollo, a 'lazy' blue villager with half-lidded eyes. He says 'beaulch'. 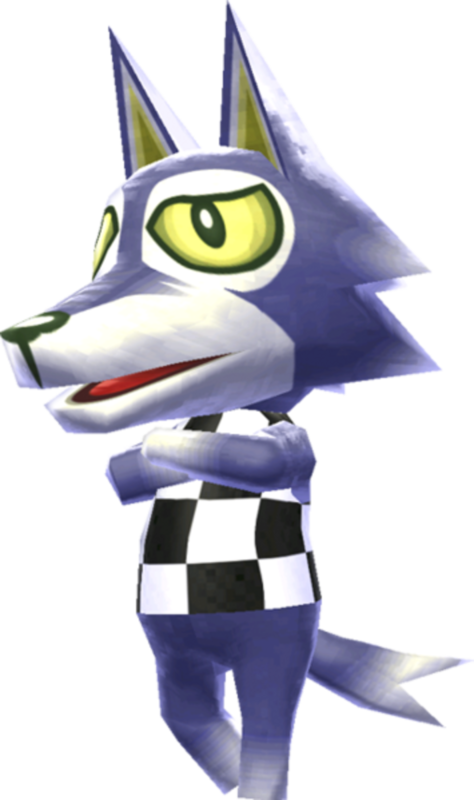 Unfortunately, Rollo has not made an appearance since the original Animal Crossing games. Horses have been around since the beginning, but my favorite horse is new to Animal Crossing: New Leaf. Papi is a white and brown horse with a 'lazy' personality. He says 'haaay' initially. Some kangaroos are like two villagers in one, because each female has a joey in their pouch! My favorite kangaroo is Kitt, a brown female kangaroo. She has a 'normal' personality and says 'child'. 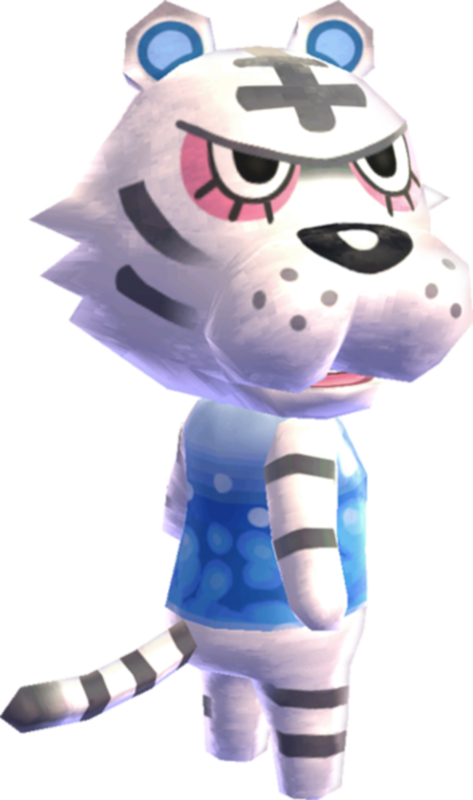 She has been in every Animal Crossing game so far. Koalas are one of the unique animals in Animal Crossing. Faith is my favorite koala. 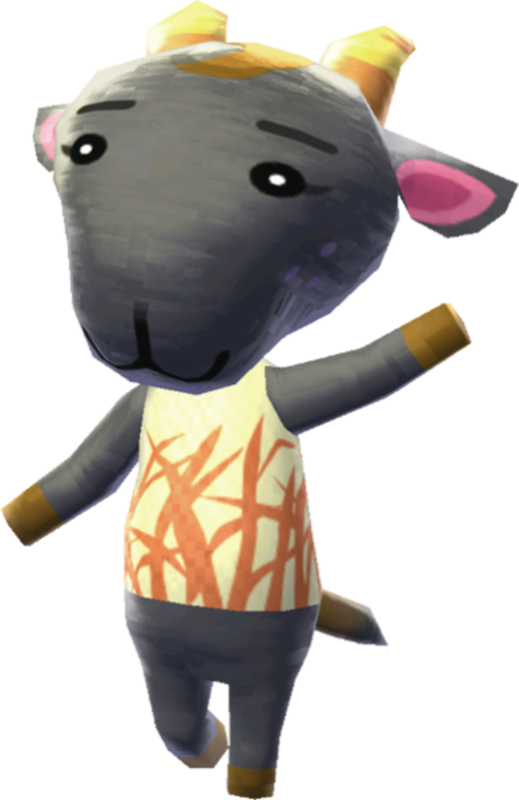 She was a special villager who lived on the island in the original games. She wears a flower in her hair and says 'aloha'. She has a 'normal' personality. 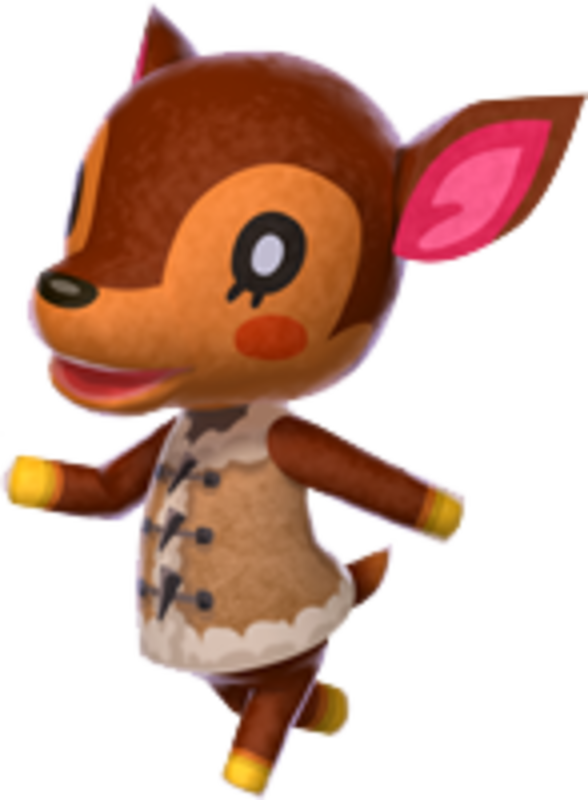 She has not been in any Animal Crossing games since the originals. All the lions in Animal Crossing are male. My number 1 lion is Bud. Bud is a 'jock' lion who says 'maaan'. 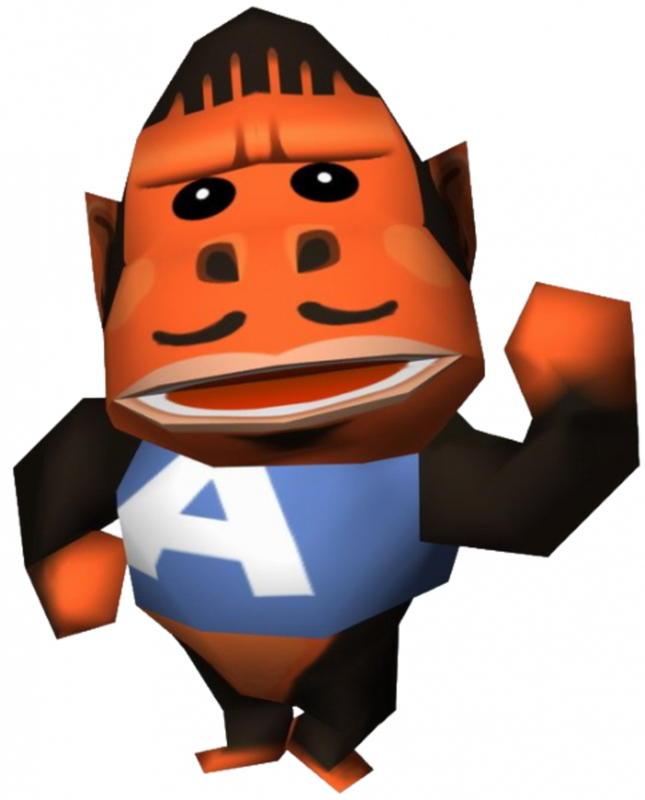 He was an islander villager in the original Animal Crossing games, but he has also been in releases since then as a regular villager. He wears sunglasses. 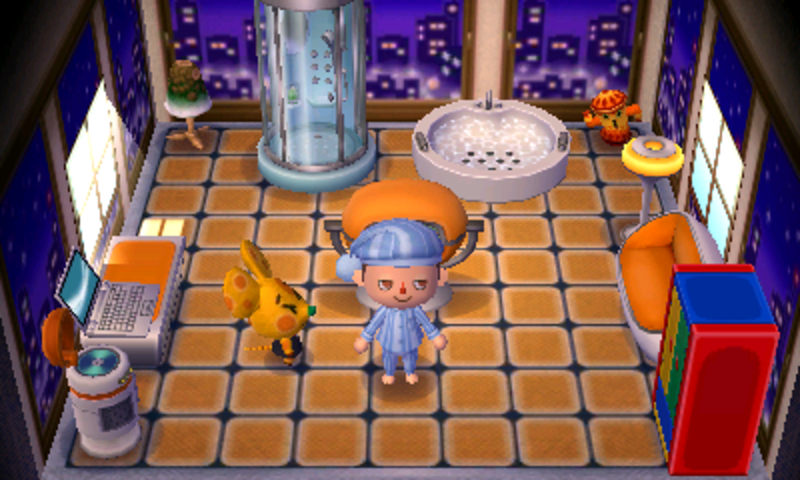 There are several different mice in Animal Crossing. My personal favorite is Chadder. He looks like he is made of cheese! He is a new addition to Animal Crossing: New Leaf. He has a 'smug' personality and says 'fromage'. His initial clothes are a tuxedo. Again, monkeys are not my favorite but there are still some cute ones in Animal Crossing. They were introduced in Animal Crossing: Wild World. My favorite is Monty, a 'cranky' blue monkey. He has been in every game since Wild World. He says 'g'tang'. There are only 3 octopuses in Animal Crossing, making them rare. My favorite is Marina, a pink 'normal' octopus. 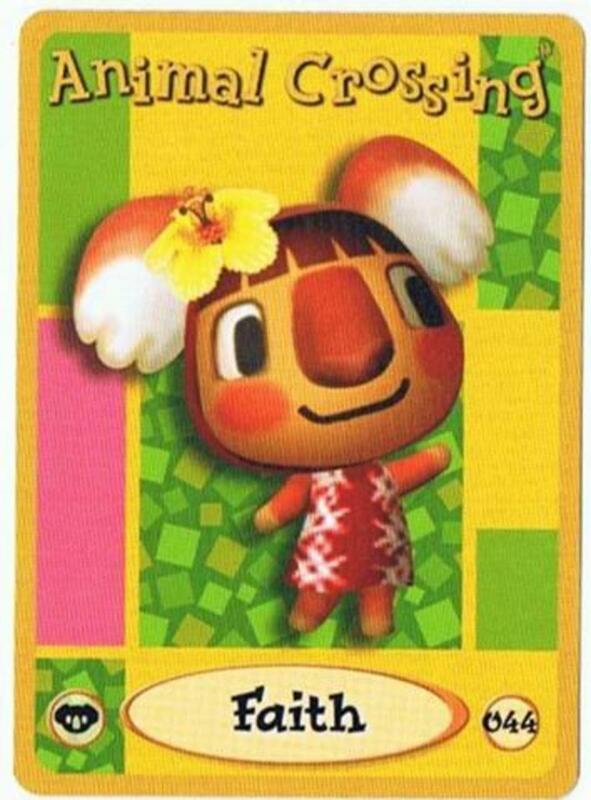 She was originally an island villager in one of the original games. 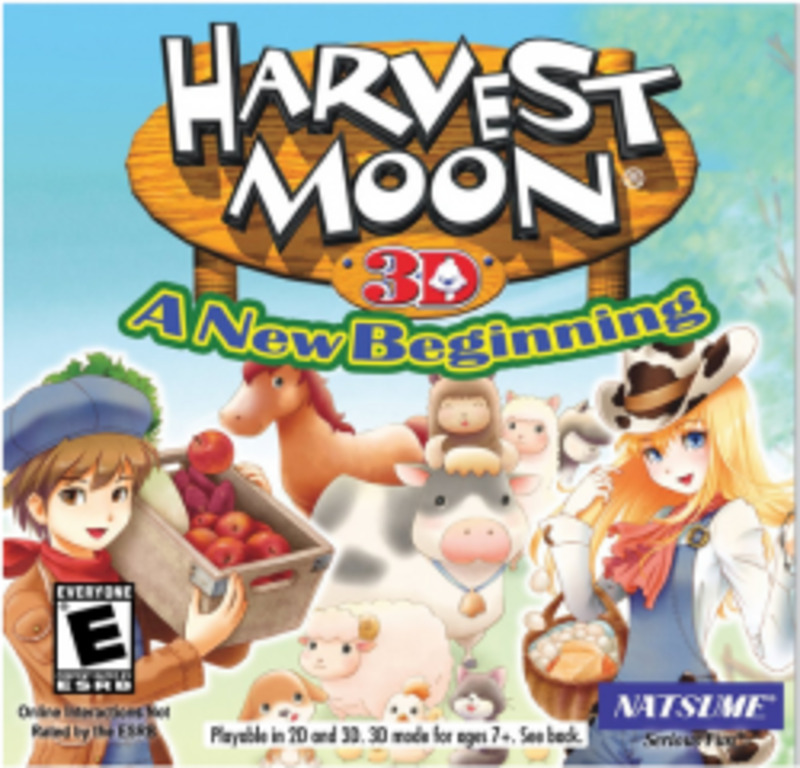 She has since appeared in other games, including Wild World, City Folk, and New Leaf. She says 'blurp' initially. Yep, these tall birds are found in the Animal Crossing world. My favorite is Flora, who actually looks like a flamingo! She is new to Animal Crossing: New Leaf. 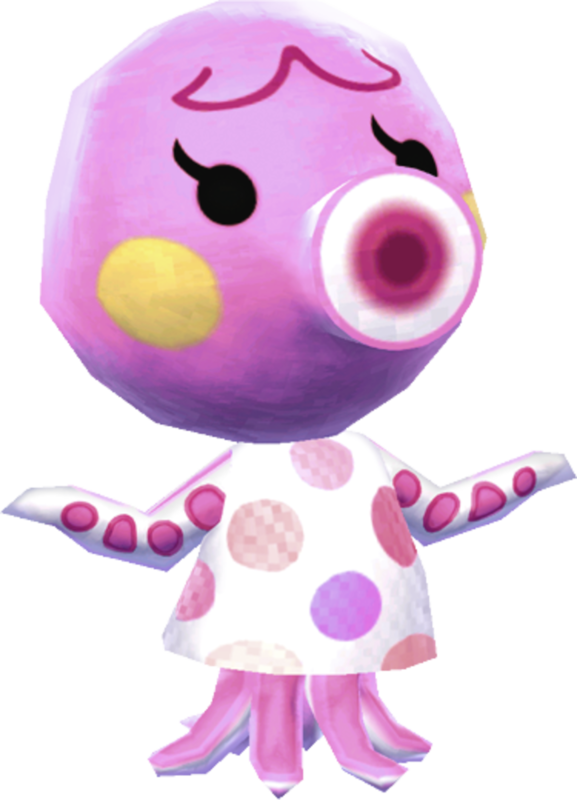 She is a 'peppy' villager who initially says 'pinky'. There are a lot of different penguin villagers in Animal Crossing. My personal favorite is Aurora. She has black eyes, a 'normal' personality, and says 'b-b-baby'. 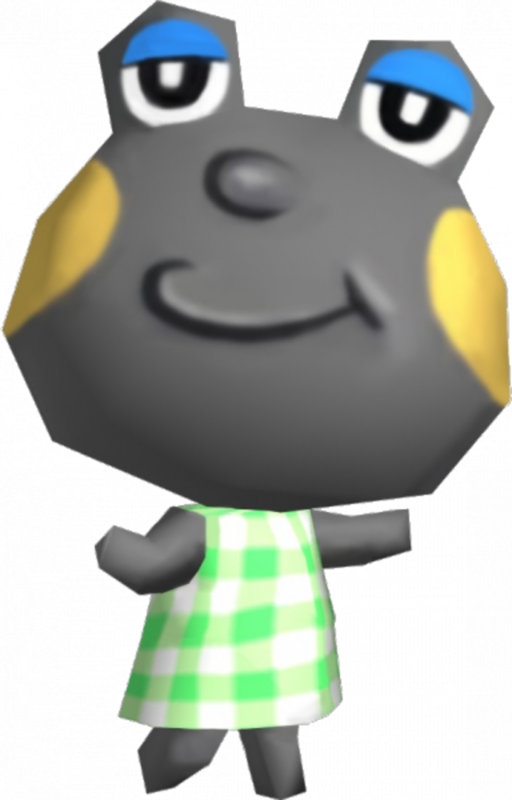 She has appeared in every single Animal Crossing game thus far. 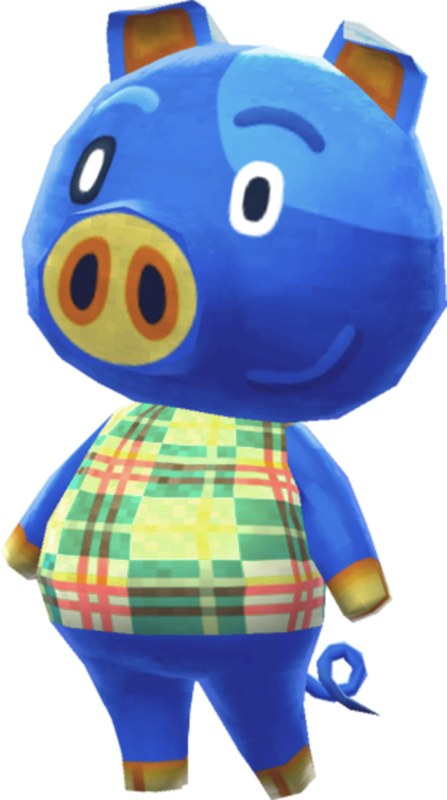 There are also plenty of pig villagers in the series. For me, the number one pig is Hugh. Hugh is a blue pig with spots. He has a 'lazy' personality and says 'snortle'. Hugh has been in every Animal Crossing game so far. Rabbits are a popular animal in the Animal Crossing series. 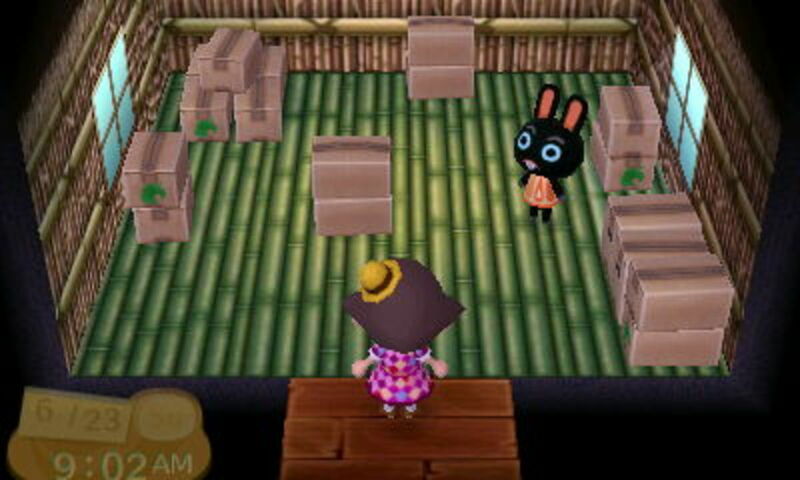 My favorite rabbit is Cole, who was newly introduced in Animal Crossing: New Leaf. He has a 'lazy' personality, says 'duuude', and has cute buck teeth. Rhinos are a rarer animal in the series. 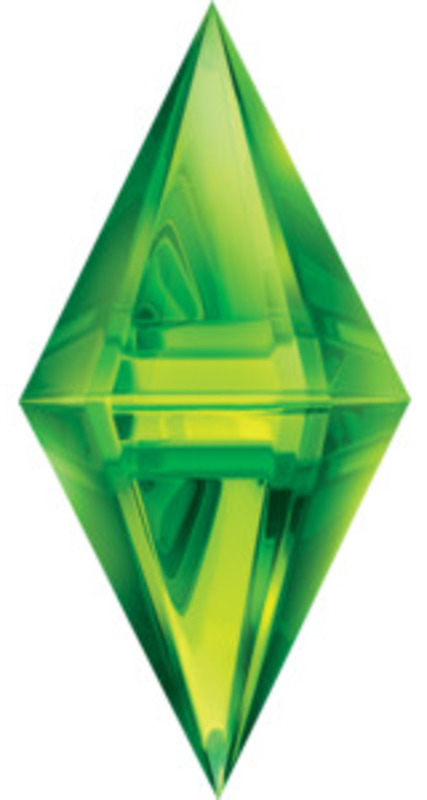 My favorite is Hornsby, who sadly only appeared in the original games. He is a 'lazy' blue rhino who has half-lidded eyes and says 'schnozzle'. 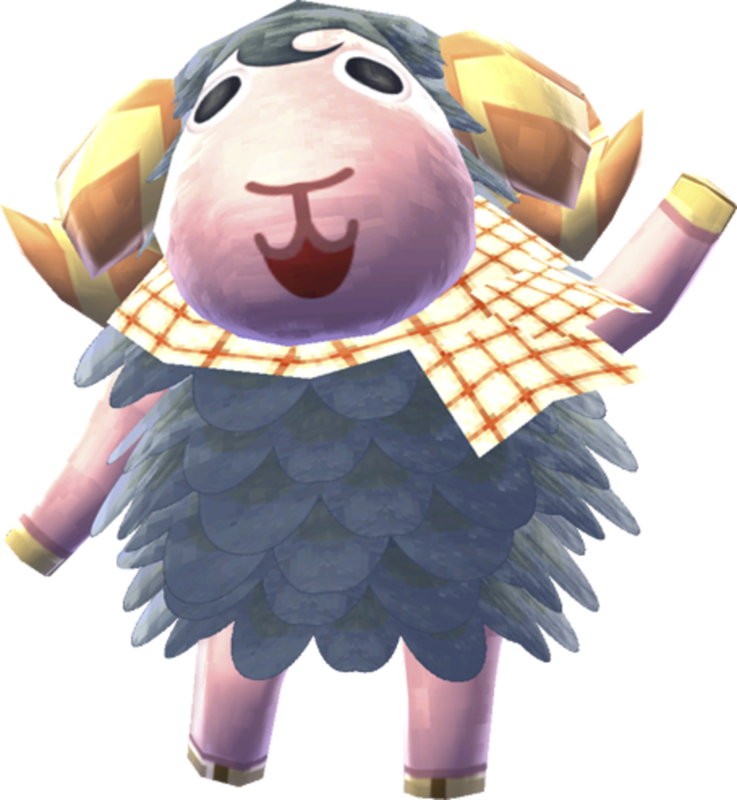 The sheep in Animal Crossing are really cute. My personal favorite is Eunice. She has been in each game except Animal Crossing: Wild World. She has a 'normal' personality and says 'lambchop'. Her scarf is orange. 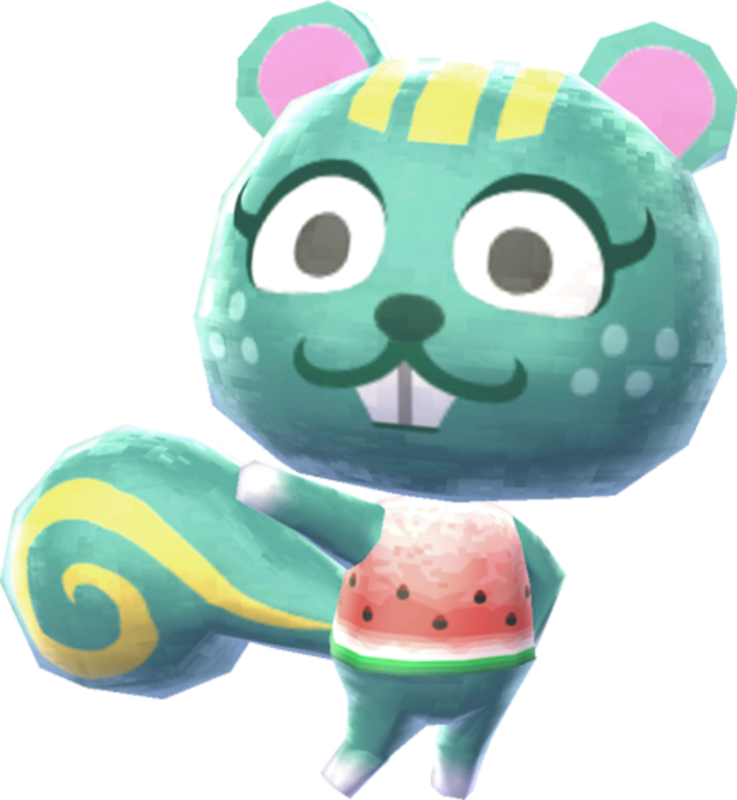 There are several squirrel villagers in the series. My favorite one is Nibbles. She is a blue-green squirrel with freckles and stripes. She is 'peppy' and says 'niblet'. 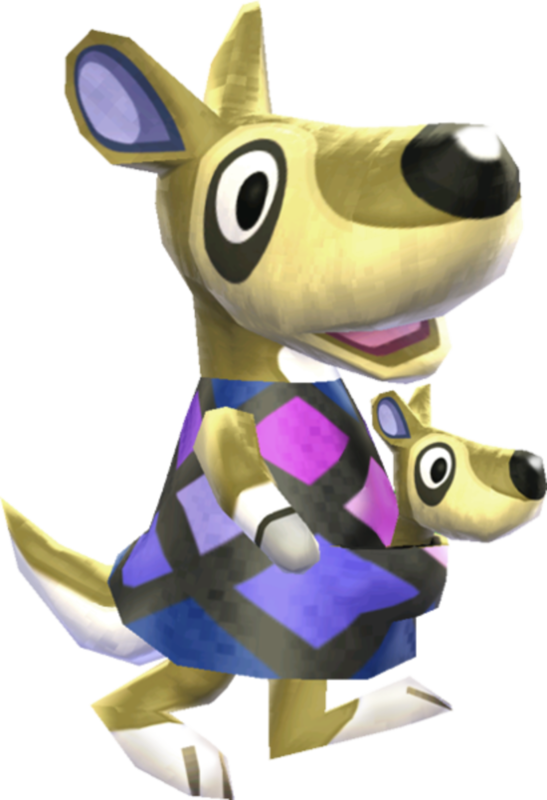 Nibbles has appeared in all the Animal Crossing games so far. Tigers are fairly rare cats in Animal Crossing. My number one tiger is Rolf, who is white with black stripes. He is 'cranky' and says 'grrrolf'. 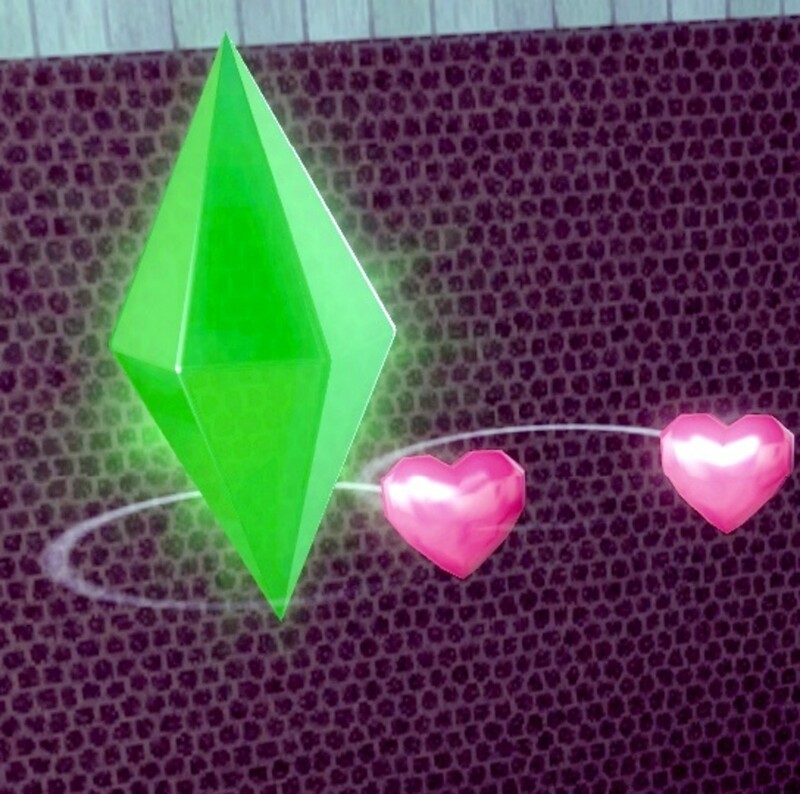 So far, Rolf has been in every single Animal Crossing game. What is your favorite animal type in Animal Crossing? The wolves have spiky hair and tails. My favorite wolf is Lobo, who is blue with yellow eyes. He is a 'cranky' villager who says 'ah-roooooo' at first. He has appeared in every Animal Crossing game thus far. Let me know who your favorite villager is in the comments!